Combines an antihistamine and a decongestant to effectively relieve itching, tearing and redness of the eye caused by allergies (pollen, trees, grass, ragweed, dust, pets and mold). Adults & children 6 years and over: Place 1 or 2 drops in the affected eye(s) up to four times a day. Some users may experience a brief tingling sensation. Medicinal Ingredients: Pheniramine Maleate 0.3% w/v, Naphazoline Hydrochloride 0.025% w/v. Non-Medicinal Ingredients (alphabetically): Benzalkonium Chloride, Boric Acid, Disodium EDTA, Sodium Borate, Water. If you experience eye pain, changes in vision, continued redness or irritation of the eye or if the condition worsens or persists for more than 72 hours, discontinue use and consult a doctor. Do not use this product if you have heart disease, high blood pressure, difficulty in urination, narrow angle glaucoma, or use in children under 6 years of age unless directed by a doctor. 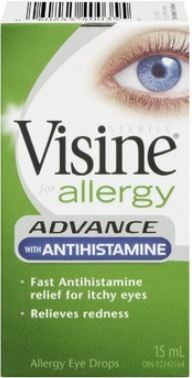 Overuse of this product may produce increased redness of the eye. If pregnant or breastfeeding, ask a doctor before use. Keep out of reach of children. If swallowed, contact a Poison Control Centre or doctor right away. Remove contact lenses before using. To avoid contamination of this product, replace cap after use and do not touch dropper tip to any surface. Do not use if solution changes colour or becomes cloudy.